Let us follow the movement of the Gospel of Matthew. Jesus came down to be born among us and so to be identified with us. He grew up as any other child would, except that He was harmless and without sin. Now, in his baptism, He has identified with us. Now he is going to be tested because there are some real questions to be answered. Is the King able to withstand a test? and can He overcome? Incite or entice to evil; seduce. There is something in each of us which causes us to yield to evil. This was not true of Jesus “...For the prince of this world cometh, and in me he hath not any thing." In other words, “He has no claim on me”. Jesus was ...”holy, innocent, undefiled, separated from sinners” (Hebrews 7:26). So the temptation for Jesus had to be different from that which would cause me to fall, in that it needed to be a much greater temptation. The second of the two fold meaning is “to test.” God does not tempt men with evil according to James 1:13. Yet, we are told “...God tempted Abraham...” (Genesis 22:1) This means that God was testing the faith of Abraham. Jesus is now to be tested. Was it possible for Jesus to sin? It depends on how you define "possible." If "possible" means, "Did he have the brain and the natural capacities to discern a temptation and choose it," then yes. He had a brain and he had a will. If he didn't, he would not have been a human being. He's discerning, he's thinking, he's feeling. He knows what hunger is. He knows what sexual arousal is, and so on. He knows these things! He's a human being. If he didn't have those then he wouldn't be a human being. But historically, the word "possible" has another meaning, a very important meaning—namely, a moral ability. There's a natural ability, which he must have in order to be accountable and human, and a moral ability, which he did not have. A moral ability is when you are bad enough to choose sin. There's enough badness in you that you can choose sin. Jesus didn't have it. There was no badness in Jesus. Therefore he did not ever, in his willing and feeling and in his perception of temptation, he didn't ever rise to the point of going there. Because that's evil in us! Evil is not just acting. Evil is wanting to act in a certain way. Craving money is as bad as having money that you stole. "I want the praise of man, I want that money, I want that lustful object"—and those wants are evil. Jesus never had any of those. He was perfect. And if you don't have those, you can't do it! You can't choose to sin if there is no desire to sin. And Jesus never had any desire to sin. Therefore he couldn't sin. And so, in those two ways, it was possible and it wasn't possible for Jesus to sin. May I say to you, that the reason the Lord Jesus was tested was to prove, to demonstrate, that He could not morally sin. But I believe it also demonstrated Jesus had natural abilities – He was able to choose, to think, in other wards to demonstrate that he was a human being with the same natural desire that we all have. Lets go on....In Matthew 4:1 we see that Jesus was tempted and tested by the devil. Then in verses 2-3 we are told that after fasting for forty days and forty nights, he got hungry. This is where the tempter tempts his humanity in the natural sense. He said that if Jesus was the Son of God that he should command the stones to be turned to bread. So the first test we read of here is a physical testing. Jesus was quoting Deuteronomy 8:3. Jesus surely new Deuteronomy, and He believed it was the inspired Word of God. Now the third testing was psychological. Satan showed Him the kingdoms of the world and their glory. This you see, is a psychological temptation. Man desires to reign over things. It is in his nature. In Genesis 1:21 God said, “let [man] have dominion over the fishes of the sea, and the fowls of the air, and the beasts, and the whole earth, and every creeping creature that moveth upon the earth.” But he would morally want to do it the way God would want it to be done. That is one of the reason he was made in Gods image? He thought like God! At least until he fell. Then the image was warped, blurred because now he had a sin nature. Morally he lusted after things he should not have. Just as Man did in Jesus time, and just as Man does today. He is quoting Deuteronomy 6:13 and 10:20. We see that our Lord answered each time with Scripture. Certainly, that ought to have a message for all of us. Why is it that many of us are having trouble living the Christian life? May I say this very kindly: I is ignorance of the scriptures and ignorance of Church teaching which is grounded in the scriptures and the fathers of the Church. Notice that our Lord always answered by giving the scripture. I believe that the bible has an answer for your particular problem. That doesn't mean I know the answer for your problem. But God has an answer for your problem, and it is found in scriptures and the Holy Catholic Church who helps you by guide you with Holy Spirit direction. Let me repeat, the Lord Jesus answered Satan every time out of the Word. He did not say, “Well, I think this” or “ I believe there is a better way of doing it.” He said very definitely that the written Word of God says thus and so. He used the Word of God for His answers. And for the child of God under the authority of Christ Church, that should be enough! By the way, the Devil seemed to think that Jesus answer from the scriptures were good answers because in the next verse we read- Then the devil left [Jesus]; and behold angels came and ministered to him. Luke 4:13 tells us that the Devil left Him for a little season. I think he was back the next day and was testing Him throughout His life. 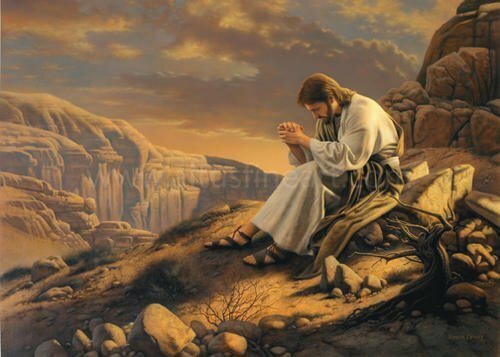 Especially do we see the temptation of the Devil in the Garden of Gethsemane where Jesus endured indescribable suffering.